Views from the loch. : Long distance swimmers! image 01 - no fishing in green areas next Saturday! As we do every year we are welcoming the entrants for the swim in the loch. 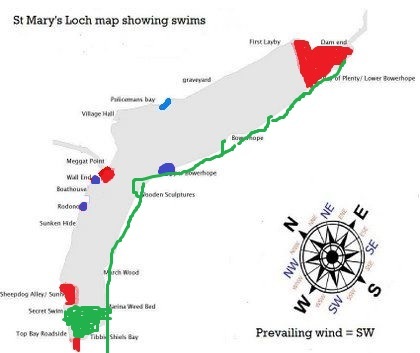 There will be around a dozen swimmers hoping to do the 1km swim which will take place in the secret swim area to the tibbie march fence. The areas are crudely highlighted in the attached map. We are also asking that no angler should fish the east side (Bowerhope) of the loch as a few extra hardy individuals will be attempting to swim the length of the loch and back. The restrictions will be in force from 07.00 till around 17.30 hrs on Saturday 10/09/2016. Of course I am referring to the opportunity we created for Mr Xxxxx our ex lochkeeper to come and seek an amicable settlement with our treasurer Elliot Fraser on a one to one basis. It was a golden opportunity for Mr Xxxxx to emerge from the situation he created with a degree of credibility! Now if this equipment was ours individually I think the consensus was that we leave the situation where it currently stands with us losing a little, Mr Xxxxx losing a lot and we could go our respective ways with Mr Xxxxx having nothing further to do with the club! The difficulty we have however is that the club property he is refusing to hand over belongs to every member of the club and as such we must do all that we can to effect its return! Therefore our hands being tied we have been left with no other course of action than to take further steps to retrieve our property. Moves to this end will be initiated on Monday. No one will be able to say that we did not give him a chance to emerge from this situation with at least a modicum of dignity! He seems to have disappeared but if you do come across him ask him why he is not returning your property! Well its coming along just fine with 6 new members registering their details with us this week, I reckon we are now pretty close to having the complete database. Along with this good news came the inevitable bad news. Members who had joined and were promised help and assistance from Mr Xxxxx ignored and forgotten! We have put in place a scheme to give these new members the introduction they should have gotten soon after joining but instead got nothing! His true legacy is being revealed as time goes on! Apologies but that’s it for today my think pad screen has given up the ghost and typing on my phone or using the telly as a screen is a tedious business, hope to have a replacement next week.